A dramatic final day of racing was expected in Portoferraio but due to the complete absence of wind, the Race Committee was unable to start Race Six, the round that would have enabled teams to discard their worst score. 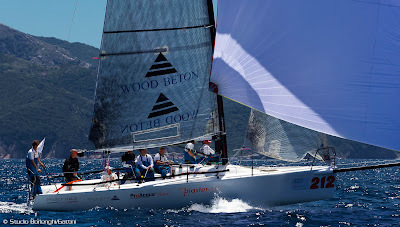 Portoferraio is now complete with only five valid races on the scoreboard and Saturday's scores stand as final the final results. 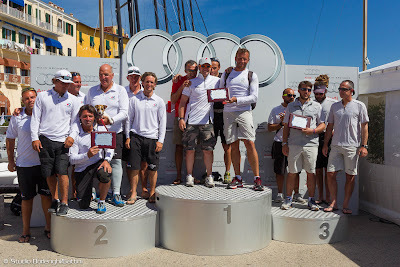 Again, it is with great congratulations to Lanfranco Cirillo aboard Fantastica and his tactician Michele Paoletti, with crew comprised of Daniele De Luca, Claudio Celon, Riamondo Tonelli, Eros Paghera, Enrico Verdinelli and Enrico Turrini as they are Portoferraio Audi Sailing Series winners. For Cirillo and team, this is their second win in a row as they also claimed victory in Porto Ercole about three weeks ago. In second overall is Portoferraio first day leader Roberto Tomasini Grinover with tactician Vasco Vascotto on Robertissima. Vincenzo Onorato's Mascalzone Latino finished in third, Andrea Pozzi's Bombarda was fourth and Naofumi Kamei on Mamma Aiuto! rounded out the top five. 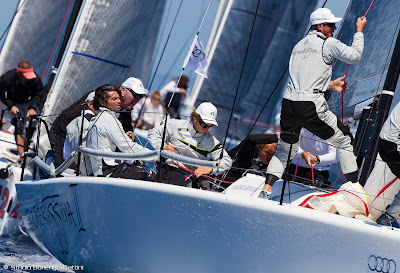 Following Cirillo's success in Portoferraio, he is now seated first overall in the 2013 Audi Sailing Series Ranking, ahead of Pozzi by one point. The two have placed a massive gap in points between themselves and Edoardo Lupi's Torpyone in third and Onorato fourth. Tomasini Grinover is now placed fifth overall.